The Tivoli Bowling Lanes are located in the lower level of the historic Tivoli building which was constructed in 1928. The building is located across from the Metra (commuter rail) station in the heart of the Downers Grove business district. It takes a sharp eye to find the entrance and a relatively long climb down stairs into the bowling alley area proper. 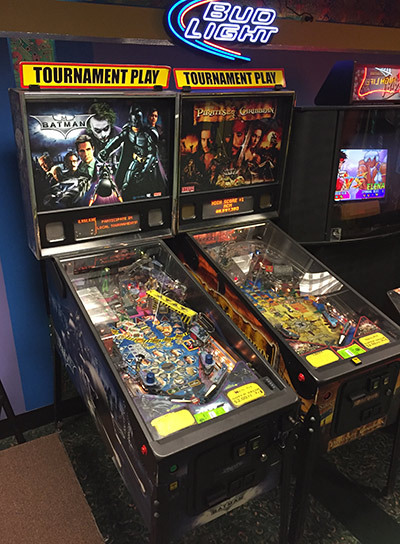 The bowling alley has been in the present location for nearly a decade, but has been steadily updated with modern equipment, a bar, a dining area and a game room that in recent years has included two pinball games. I re-visited Tivoli Bowl in the early part of November 2016; I had some time on my hands before the doors opened for a screening at the Tivoli Theater of Eight Days A Week- The Touring Years which is a film directed by Ron Howard documenting the Beatles during the period 1965-1969. 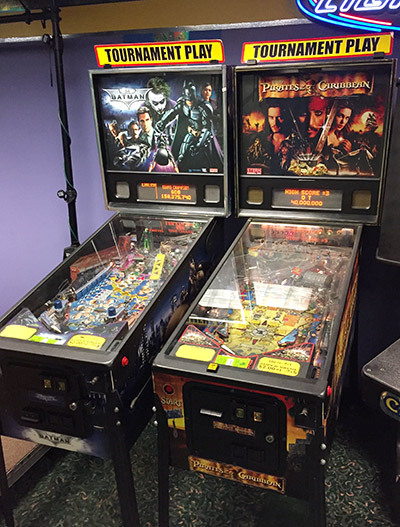 Currently the Tivoli Bowl has Batman: The Dark Knight (Stern, 2008) and Pirates of the Caribbean (Stern, 2006) in the game room. They are set to fifty cents per game or five games for two dollars. 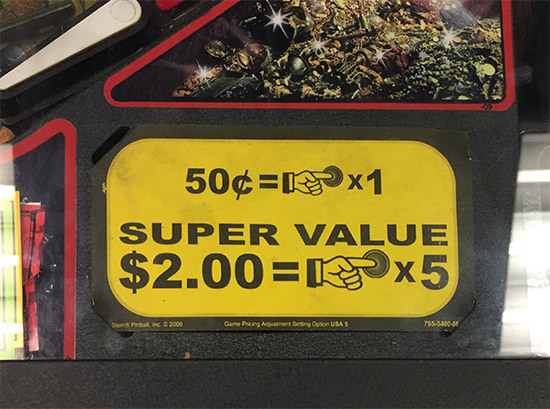 Both games accept quarters or dollar bills and both are set up for 'tournament mode' if the player so desires. The pinball games had been relocated slightly from when I had last visited. This apparently was to accommodate some new games that were not there before. Unfortunately the pinballs are now directly under a very harsh florescent light fixture which casts a terrible glare right in the glass covering the lower third of the playfields. It takes quite a bit of concentration to “look beyond” the glare and see where the ball is at when in play. I felt that the glare makes accurate shooting quite difficult. 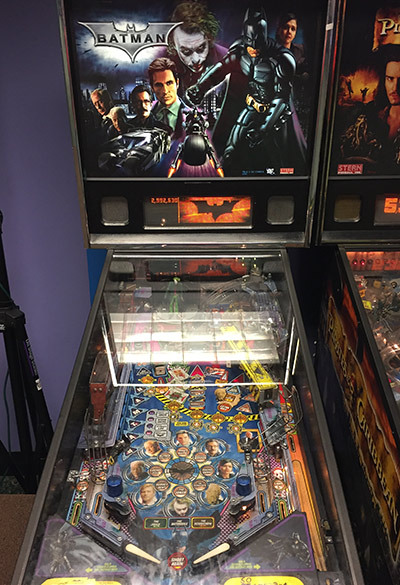 Batman was in fair to good condition and I felt that the free game threshold was set so that an average player with some luck could win a game. Everything seemed to be working on the game with the possible exception that the right overhead ramp would randomly drop the ball in the playfield instead of the scoring gate for no apparent reason. The bumpers and rubber cushions seemed to be quite lively and allowed 'saves' that might otherwise had not been possible. Pirates of the Caribbean was in only fair condition, having a quite dirty playfield and some features that seemed to be malfunctioning. 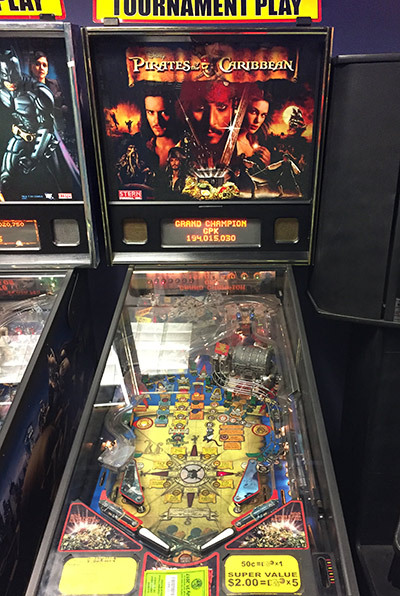 I suffered stuck pinball syndrome a couple of times and discovered that the tilt mechanism was set quite generously; fortunate for me! Overall this game was more frustration than joy to play correctly because of the need for some basic maintenance. In summary, I feel that the Tivoli Bowl game room is a decent place to pass some time waiting for a train or a movie to start. Perhaps next visit I will have time for a pint to help me improve my game play?